Peoria (IL), USA – BossTek announced the debut of the DustBoss® DB-30 FusionTM, the newest model in its growing family of self-powered dust suppression equipment. The new design is a versatile and transportable atomized mist unit, engineered with a workhorse electric motor and 30 KW generator. 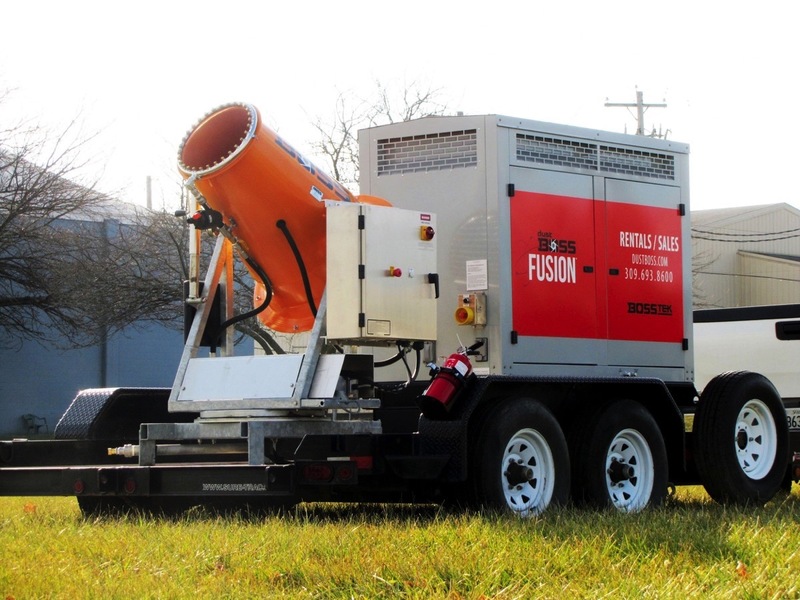 Permanently mounted on a rugged road-worthy trailer, the company’s Fusion lineup is proving to be a popular and effective means of delivering powerful dust suppression technology to sites that lack a convenient power source. The DB-30 Fusion™ is a versatile and mobile atomized mist solution from BossTek. Unlike its larger siblings, water is supplied to the DB-30 Fusion by a standard 5/8″ (15.8 mm) garden hose, so it can be used at any location with a working hose bib. Equipped with an in-line 75 mesh, 200 micron filter, the unit can also be specified with special filtration to accommodate non-potable water sources. With an adjustable throw angle from 0 to 50 degrees of elevation and a range of approx. 30 meters (100 feet) in calm conditions, the standard configuration includes user-definable 359 degree oscillation, allowing the unit to cover as much as 2880 square meters (31,000 square feet) with a powerful dust-trapping mist. The new design can also be optimized with a Variable Frequency Drive (VFD) to precisely adjust fan speed. An optional dosing pump is available for precise metering of additives to even further enhance particle control. The new design utilizes the same rugged construction as the larger models in the DustBoss lineup. The extremely water-efficient design consumes just 9.5 liters per minute (2.5 gallons per minute). That’s compared to competing dust control methods such as manual spraying that can use hundreds of gallons per minute, resulting in over-saturation, run-off concerns and higher water costs. A touch screen panel for controlling the DB-30 Fusion is encased in a NEMA 3R cabinet, allowing operators to control oscillation, fan and water. The cabinet is constructed for outdoor use, designed to provide protection against solid foreign objects (such as dirt), air (dust, emissions), water (rain, sleet, snow) and ice formation. Maintenance requirements for the new design are minimal, even though the unit carries an industry-leading 3-year/3000-hour warranty on the dust suppressor and a 2-year/2000-hour warranty on the gen set. 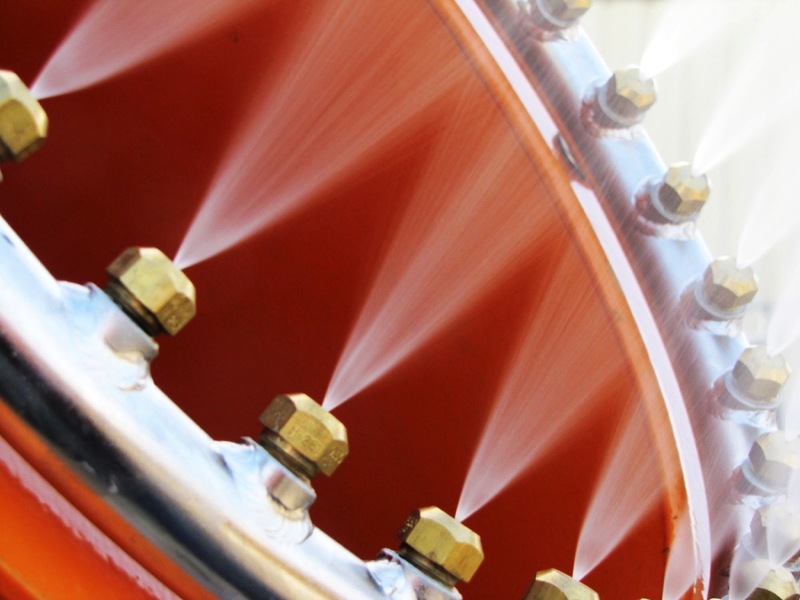 If potable water is being used, nozzles typically need to be inspected just once per year. The turntable bearing on the oscillator should be greased annually or as needed for harsh service conditions and the fan motor should be lubricated every 10,000 hours. Like any diesel engine, the gen set should have regular inspections and changing of oil, coolant and filters. The manifold and specially-designed nozzles atomize the water supply for maximum particle attraction. “This design was developed in response to input from the marketplace, which indicated that some customers would benefit from a more compact design that’s well-suited to smaller projects or tight spaces,” said BossTek Sales Manager Mike Lewis. 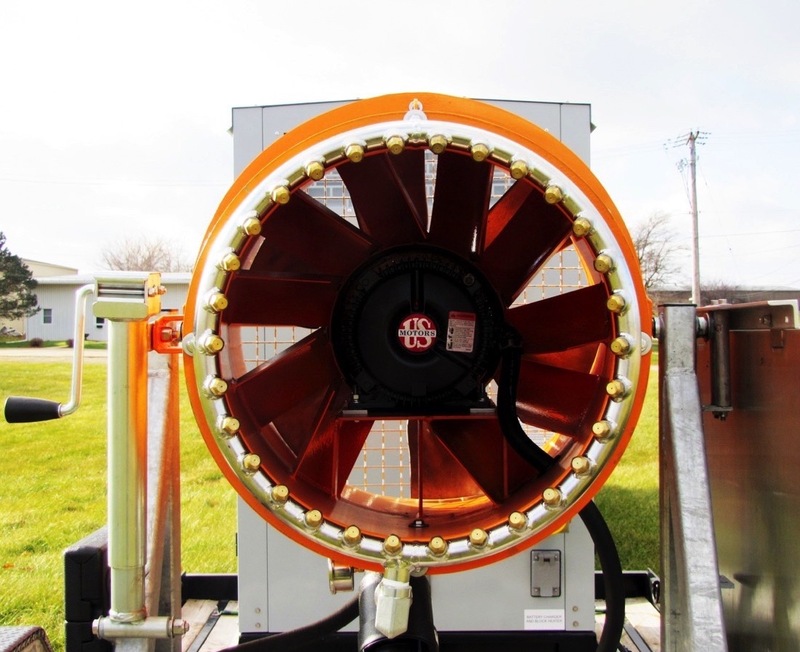 “The 7.5 HP electric motor generates 9200 CFM of air flow, and it uses the same industrial-strength construction as the larger models: a manifold with 30 specially-designed nozzles that atomize the water supply, creating droplets between 50 and 200 microns in size for maximum particle attraction.” The company also offers a full line of surfactants, tackifiers, and odor control additives that are fully compatible with the equipment.